Intermittent fasting is the practice of abstaining from food for a period of time that is both deliberate and controlled. Fasting in this way has many health benefits and has been used throughout the history. As with a lot of diets, there are many different plans to choose from and what may be right for someone may not be the right choice for you. 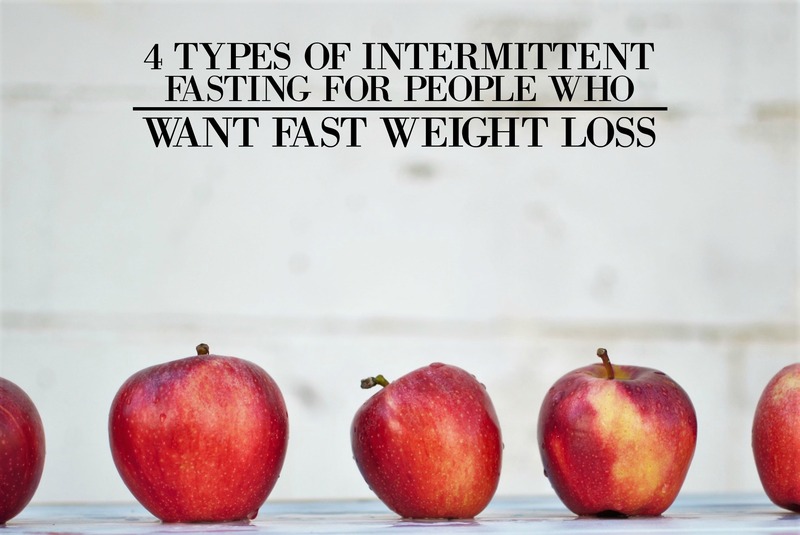 In this post we are going to take a look at 4 different types of intermittent fasting that are designed specifically for people who want fast weight loss. But weight loss is not the only benefit that you will gain from fasting! You can also expect increased mental clarity and concentration, and it can even reverse type two diabetes, so it’s definitely worth looking into. As with all new diets, it is worth doing a little research around the subject before you start, but take the following as a jumping off point and see which one is right for you. This is probably the easiest place to start. One of the most widely known and popular types of fasting is something called 16/8 intermittent fasting. Essentially this involves fasting for 16 hours and keeping a window of eight hours for food consumption. You will be able to see similar benefits to your waistline by skipping a meal. Either breakfast or dinner would work best for this type of fasting; the idea being that the majority of the not eating window would be taken up by sleep. This is an great way to begin your fasting journey. Give it a go for a week and see what happens! This is a bit more of a difficult type of fasting and is probably not best suited for beginners, although the results can be great. Basically, as its name suggests, you eat normal on one day and go without the following. There are different versions of this type of fast, for example, some people allow a small calorie intake (maybe 500 calories or so) on the non-consumption day. It really depends on you but it is worth bearing in mind that you will probably go to bed hungry on your foodless days. So basically, this is more of a short-term type of fast but the results will be great! This one allows you to eat as you normally would for five days and fast for the other two. The fasting days don’t have to be back-to-back but can be intermixed throughout your week. This allows you a bit more flexibility and enables you to tailor this type of fast around your lifestyle. Again, as with the alternate day structure, there is potential for a small allowance of calories (500 or less) during the periods of fasting.This is probably another good one for people who are less experienced at intermittent fasting. Essentially, this type of fast allows you one big meal in the evening and the rest of the day is spent without eating. However, you are allowed small portions of raw fruit and vegetables, as well as protein throughout the day, but try to limit your intake otherwise you won’t get the desired results. Hopefully these fasts will give you some ideas should you wish to give intermittent fasting a try. As you can see there are many different approaches to this practice and you should be able to find one that is ideally suited to your needs and goals. As said at the beginning, it is worth doing your research before you begin. And the keyword to remember here is ‘control’, which is the most important difference between fasting and starving. All the types of fasts discussed in this post are designed for adults and they are not suitable for children. Whichever approach you decide to take, I hope you quickly get the results you want and reach your goals.